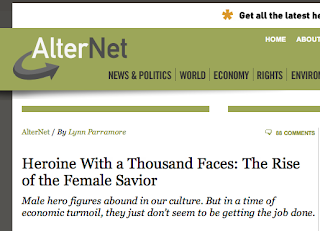 Teaching High School Sociology: The Female Hero--Has She Returned? In my time as a teacher, I've had the great opportunity to teach in the fields of Sociology, Psychology, Anthropology, Philosophy, and Religion (and mythology). One book I picked up long ago had the title of something like, "When the Gods Were Women" or something similar. It was about the ancient religions and how much of their religions were goddess worship, the worship of Mother Earth. In various books by Joseph Campbell such as The Hero with a Thousand Faces (The Collected Works of Joseph Campbell), and The Masks of God, Vol. 1: Primitive Mythology, he speaks of the Hero's Journey and other aspects of what makes a hero, but focuses on the male hero only. Buffy the Vampire Slayer: The Complete Series . I have all seven seasons and have seen episode at least two or three times. I know, kind of a geek. But I loved how Josh Whedon created a female lead who not only was strong and capable, but was flawed, struggled, and was a deep, three-dimensional character who was engaging. So for those of you who highlight the female in the culture, do check this out.